This is going to be good so keep reading. I just love attending events like this. I get all geeked up! For me, it is important to surround myself with people who are leaders because they are inquisitive, thought provoking, and fearless. These are the types of people who get things done. Leadercast Live offered me that and more. My brain was doing the happy dance soaking up every-bit-of-wisdom possible from such an esteemed panel. By nature, I am a very curious human being. I’ve naturally always had a hunger for learning. I really live to get into other people’s heads and find out where they are going in life. When I find a person who has found a way to live fruitfully doing what they love to do, I become laser-focused because I know I can make a connection with them and learn something by finding out what they did to get there. My present to you is to share all of the highlights from each speaker. However, before I get down to business, I wanted to digress for a moment and tell you about the hosts of the show, Bill and Giuliana Rancic. Bill Rancic won the first season of The Apprentice, and his wife, Giuliana, is the current host of E News. 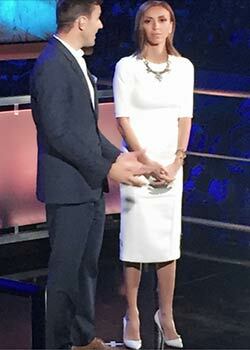 Giuliana is a quick wit that uses her natural humor for shock value whereas Bill is more laid back. Together, the two of them make up quite the dynamic duo on stage. Up close, Giuliana is absolutely stunning and Bill’s handsome charm compliments him perfectly. They have learned to play off one another’s strengths. His comebacks are supportive and effortless allowing his wife to take the lead. The two actually started their relationship with humble beginnings. They were both going in separate directions before they figured out they worked better as a team. Today, they own multiple restaurants, have written books, and travel working together and separately as hosts. They truly helped one another up their respective games, and the rest is history. Every big dream starts with an idea and comes together with the help from others who believe in your vision. Each speaker that came on to that stage spoke about finding the right support system. If you are finally ready to really go for it, take all the speakers of Leadercast Live and my advice and start by building your own team. This can start with finding a coach and others who can help you expand your vision. Being around people who are living out their own dreams right in front of you will get you in the right mind set that you can and will live your dream too! If you’re feeling stuck, don’t get all Debbie Downer. Remember, it is just part of the process. Here is the deal: If you want to see results, you must get out of your comfort zone! Quit hanging with the status quo. Step up your game by meeting new people. It’s when you take action by making small steps that you are able to make BIG life changes. And guess what? It is the BIG life changes that get you to FREEDOM and really living the life you want. If you’ve read this far, you’re seriously ready to make a life change or… you must just enjoy my commentary. Either way, here is the good part. I took some notes from each speaker’s speech. As you read, think about your calling in life. If any of this speaks to you, it is your time to take action. A great resource that Andy spoke about is the book, “Start Something That Matters” written by the founder of Tom’s Shoes, Blake Mycoskie . https://www.toms.com, One of my dear friends Dana Spinola (fFounder of https://www.Fabrik.com and Free Fabrik) gave it to me years ago before I started The Fatherless Daughter Project. It is a short easy read to get you pumped up and inspired. What a profound idea when we live in such a self-help motivated world! In essence, Bill is telling us not to get stuck on what is wrong with your life. Instead, he says to do what your heart tells. Don’t get me wrong, sometimes we have to deal with our own negative self-talk in order to get on target. However, just don’t belabor the negativity. Decide to get on with it. Limit your field of view so you can see more. Bravery does not have to be solo. It is easier when done as a team. Make BOLD corrections, not small ones. Immerse yourself in what you fear in order to inoculate it. Pausing will only allow you to go forward. No wonder he is a Navy Seal! Talk about how to focus. Are YOU motivated yet? Her life’s mission is fighting for the right for everyone to receive an education. Think about what are you called to fight for? The bottom line is you are always learning. To keep growing you have to keep finding people to learn from. Seth Godin, innovative thinker and best selling author, said, “When we are doing our most human work… it is always too soon.” The take away here is that it will always seem like now is not the best time, but it is. Every single person who has ever started something was full of anxiety. Seth said, “Change has a twin sister. Her name is TENSION.” You should let that tension lead you in the right direction. The conclusion is that we all have to fail in order to move forward, but it’s your choice how fast you you get back up and get out there. When you fail, don’t stay down. If Lifetime movies and Ben&Jerry are down there with you, turn off the TV and toss out that ice-cream. You have a BIG life to live!